Metal base cabinetry, industrial-style pendant lighting, and a grey granite countertop give the kitchen a commercial feel. 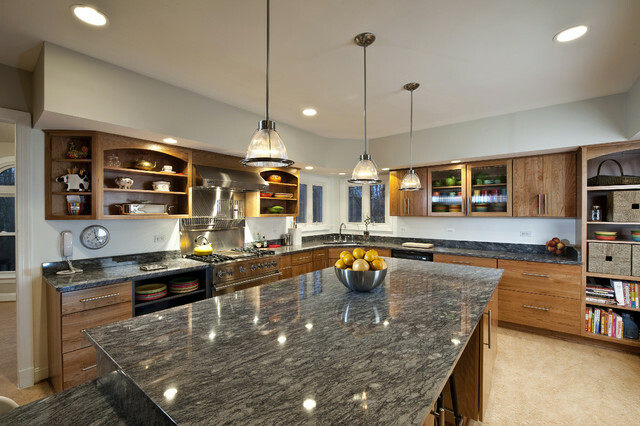 Warm wood and display cabinetry makes it feel homey. Beautiful pendants. Who makes them? - If records are no longer available, suggestions of similar pendants would be greatly appreciated! There is such a huge selection in the pendant category - starting from scratch in a search is overwhelming. Thank you, Emily. Those are all names that I haven't come across so great places to start. Pendant update: Find the pendants used in this project here! : http://progresslighting.com/products.aspx?product=P5182-09 (#P5182-09 by Progress). Name of granite - Can you please tell me if this is granite or marble and the exact name of it? how did you keep the grain of the granite flowing in the corner? Did it change direction, so runs horizontal from corner one way and vertical the other? Thanks for the question! Unfortunately since this project is from a few years ago, we do not have the granite countertop shop drawings anymore, so we can't say exactly. To answer your question though, most countertops will end up having a seam in the corner due to slab size limitations. The grain of the countertop likely changes direction at a seam near the sink, and the pattern probably does not line up exactly. If they were trying very hard to make the grain line up, they may have tried to cut the granite diagonally a bit so the grain is flowing on an angle on all pieces of the countertop. while ago and we don't have a record of the granite name. have included Metallica, Cosmus, Brown Teak, and Saturnia. Hope this helps! Thanks for the question! Unfortunately this project was completed a while ago and we don't have a record of the granite name. Based on a bit of research, the closest color we have found is "Lavender Blue" (don't let the name fool you -- it's often closer to gray). Other suggestions have included Metallica, Cosmus, Brown Teak, and Saturnia. Hope this helps! What is the metal rack above the range top? - Other pictures of this same area look like the rack is adjustable. What is it for? And, what is it called? Hi and thanks for the question! The racks behind the range are optional accessories (they are removable/adjustable) that can be purchased to go with the Viking range and hood. HI, beautiful kitchen! What is the marmoleum color? Hi and thanks for the question! Unfortunately, this project was completed some time ago and we do not have a record of the exact color name. However, Sherwin-Williams' "Spare White" #6203 might be a good alternative! where is the garbage and does it have a swing door or a pull out door - I have a similar kitchen we are remodeling and don't want the garbage to interfere with the person at the sink or trap them when it is in use. I couldn't tell where you placed yours and what kind or door it has. appreciate your help. Phase 1: The Purge1. Remove everything from your kitchen and put it on a large table or island.2. Categorize every item: spices, baking, pantry, pots and pans, storage supplies like Tupperware and plastic wrap, glassware, silverware, serveware and so on. Fireplace surround? Again, aren’t we doing the stacked stone on the fireplace?